Click on the image for a bigger view! Whew! Just got this one done under the wire for Illustration Friday's word this week, Farm. My idea came from the word woolgathering. I stumbled across this expression in a book I was reading and thought it rather funny! I had never heard that word used before! Dictionary.com shows the meaning of woolgathering as "1. )indulgence in idle fancies and in daydreaming; absentmindedness, and 2.) gathering of the tufts of wool shed by sheep and caught on bushes." Now you know. 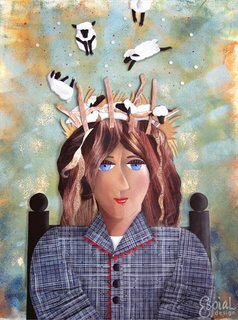 Woolgathering is paper collaged onto a painted background. I added a few paint details, then digitally photographed and added shadow and light details in Photoshop. This was a great idea and you really did a fantastic job executing it! Fabulous illo!! I'm really glad that you got it done in time so I got to enjoy it! Take care. Beautiful and interesting! I really like this. Cool illustration. And cute sheep! If they need a place to stay, they're welcome on my head. What a fantastic expression! Your illo depicts it perfectly. I missed it last week. It's Beautiful! !